Fattoria di Montemaggio collaborates with partners that follow the same mission, put the same passion and commitment in the work they do, and in the products and services they offer. Below you see a list of our most important partners of the Chianti area. Once you arrive in the main square of Volpaia you can see the restaurant “La Bottega” on one side and the Wine Bar, “Bar-Ucci” on the other side. You will meet the family Barucci that will greet you with the same warmth with which it loves its own land. Father Oriano produces seasoned pork meat and vegetables. Mama Gina is a mixture of joy, wisdom, experience, unbeatable teacher in the kitchen of the “Bottega”, will enchant you with her homemade pasta, her “ribollita” (a special vegetable soup) and other tasty recipes. You will experience pieces of true life lived in the simplicity of antique atmospheres. Experience not to miss is the one that Carla, the eldest daughter, wants her guests to try through her dishes of the best Chianti tradition, passed on from generation to generation. Authentic flavours and delicious traditional recipes are the secrets of the restaurant. The great passion for cooking and Chianti traditions induced Carla to engage in researches on cooking methods used centuries ago, that she teaches with an authentic feeling in her cooking classes. Il Bar Ucci is situated in the main square of Volpaia, right behind the fountain, which old farmers called “l’abbeveratoio”. It was there where the cows, goats and sheep drank during the hot summer days. Bar Ucci used to be a stall, and on the entrance you can still see a big arch. It is now a bar wine, where you find a selection of some great wines from the local area of Radda in Chianti, Panzano in Chianti and other small villages that are nearby. Giovannino and his family welcome their guests with their warmth and cheerfulness. The comfortable apartments and rooms (each with a private bathroom), situated in the historical center, offer a splendid panoramic view of the surrounding countryside. This traditional small grocery and butcher’s shop was opened in 1965 in Radda in Chianti. Luciano, together with his sister Anna, propose a variety of typical “salumi” (cured meats) of Chianti produced following the antique methods of the old generations. The art and craft of Chianti “norcino” worker (deli worker) was transmitted to Luciano by his father Gigi that dedicated all his life to fine tune the process of producing cured pork meats. Here you find unique products such as “soprassata”, “buristo”, “sbriciolona”, “capocollo”, “salame” prosciutto and the popular “Tuna of Radda”, “Lardone di Radda”, and “Mortadella del Chianti”. In addition, Tuscan specialities are prepared with attention and care such as slices of Tuscan toasted bread (so-called “crostini), meatloaf (so-called “polpettone”), meat skewers, duck “in porchetta” (made as an Italian spit-roasted pork), the “stracotto del Chianti” (stew) and much more. The hotel is located in an enchanting area surrounded by vineyards and woods in a noble villa of the XVIII century on top of Chianti hills. This panoramic view so loved by poets in the past, the attention to details, the elegant atmosphere and the familiar courtesy of the staff will offer you a unique and unforgettable experience. 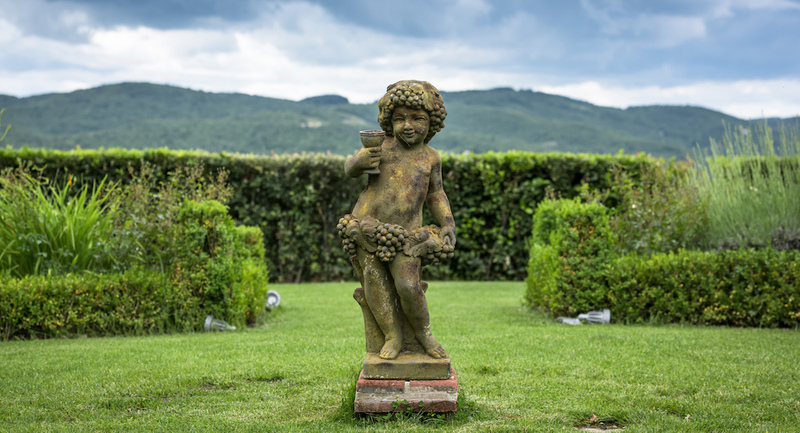 The hotel has classic rooms and superior suites, independent flats for 6 people and a fantastic spa that is situated in the old cellars of the palace from which you have a breath-taking view of the Chianti vineyards. The shop “Decori nel Tempo” is the laboratory of David and Silvia Matassini where they create high value handmade crafted objects with passion, taste, and originality. It is a special place to stop by if you come to Radda in Chianti and love art and craft. You can buy paintings, clothes, accessorizes, pottery and unique items of great artistic value and aesthetic taste that are 100% made in Tuscany. If you decide to go to Ristoro Di Lamole get prepared for an amazing sensory experience throughout your stay – what you will taste, smell and feel will be unique including the panoramic view from the terrace and the one to reach the restaurant. The menu is truly Tuscan, reflecting the tastes and smells of the region, whilst offering something for everyone. The antique Marcelleria Falorni was founded in Greve in Chianti in Florence on 1806. This small butcher’s shop has seen 9 generations of butchers work here and produce the best “salumi” (curled meat) of Chianti area with traditional methods and recipes that are transmitted from father to son. Macelleria Farloni is a well-known brand not only in Italy but also worldwide. The B&B “Le Cetinelle” is a paradise angle that is situated in a typical Tuscan farmhouse of the 500s surrounded by vineyards, olive trees and woods. Simonetta and Luca renovated this house with creativity and taste to make it a very special and cosy place to people to come. The B&B is at 600 metres above the sea level and it enjoys a nice and fresh weather during summer. There is a beautiful garden, a swimming pool with an astonishing view and 6 rooms with a private bathroom, a kitchen and a living room with a fireplace. The butcher’s shop of Dario Cecchini is a jewel at Panzano. Dario Cecchini has been a butcher for 38 years and in these years he has worked with dedication and passion to offer the best products of his region. In his shop, you can buy meat of excellence: pork, lamb and beef. Dario owns 3 restaurants at Panzano: “Officina della Bistecca”, “Solociccia” and “Solociccino”, and “Dario Doc”. “Officina della Bistecca” is the reign of the Florentine Steak and its sisters “Costata” and “Panzanese” meat. At the Officina and Solociccia, you share your table with other people and you can choose amongst a number of recommended menu at a fixed price. Solociccino is open only at lunchtime. There are some rules to follow: young people under 10 years old and old people above 90 years old pay half price; you share the table with other people; and you can bring your wine if you want! Dario Doc is a restaurant that propose 3 different menus at a good price. Santo Bevitore is a restaurant in the heart of Florence, which merges traditional elements of the Italian cuisine with a contemporary taste engaging its guest into a special journey of their senses. The central market in Florence is a very unique and original place where craftsmen and traditional shopkeepers offer their authentic products. The architecture of the market is made of iron, glass and cast iron and was built in 1874 by the famous architect Giuseppe Mengoni. This space was designed by Umberto Montano e Claudio Cardini and was inaugurated in the spring of 2014. In the market you can buy products of the Tuscan tradition of any kind: pastries, bread, fish, meat balls, vegetables, meat, buffalo mozzarella, cheese, chocolate, ice creams, handmade pasta, wines, sandwiches, “lampredotto”, a typical Florentine dish, made from the fourth and final stomach of a cow, the abomasum. There are 500 places where you can eat genuine food from 10 am until midnight.